PETERBOROUGH are two points clear at the top of the table after they extended their 100-per-cent start to the season in League One with a 5-1 thrashing of Plymouth at Home Park. Steve Evans' side went 2-0 up early on, with Matt Godden and Siriki Dembele scoring in the eighth and 11th minutes respectively. 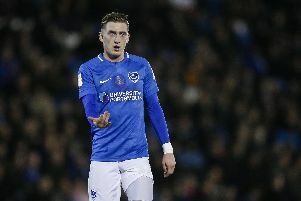 Jason Cummings then netted twice soon after the break - the second effort a penalty – and after Ryan Edwards headed in at the other end in stoppage time, there was still time for Godden to add his second as Posh made it five victories from five games. Sunderland moved up to second having come from behind to win 2-1 at AFC Wimbledon, with Lee Cattermole scoring a second-half brace. Cattermole netted in the 66th and 83rd minutes after Joe Pigott had put the home side ahead in the ninth. Walsall who won 2-1 at Rochdale and are level on 13 points with Pompey. Josh Ginnelly and Zeli Ismail scored for the visitors before Callum Camps' reply. Ismail was red-carded in the 86th minute. After sacking boss Nick Daws on Friday, Scunthorpe were held to a 2-2 draw by Barnsley at Glanford Park having been 2-0 up. The Iron looked set for victory when Cameron Burgess' header added to a Josh Morris penalty, but the Tykes, who are fifth, fought back with goals from Kieffer Moore and Dimitri Cavare. Joey Barton's sixth-placed Fleetwood battled out a goalless draw with Charlton at The Valley, a match that was held up in the first minute as home fans threw packets of crisps onto the pitch. Charlton supporters had planned the protest in response to Belgian owner Roland Duchatelet's latest cost-cutting measures. Oxford registered their first points of the season as they beat Burton 3-1 at home. James Henry and Ricky Holmes scored for the hosts in the second half after John Mousinho's opener had been cancelled out by Brewers striker Marvin Sordell in the 39th minute. Burton had Jamie Allen sent off in the last few minutes. There was a first league win of 2018-19 for Wycombe, with the Chairboys triumphing 2-1 at Bradford. Craig Mackail-Smith and Bryn Morris got on the scoresheet before a late reply from Luca Colville. Shrewsbury remain without a victory following their 3-2 loss at Luton, in which they had led twice. After Shaun Whalley's opener from the penalty spot, the Hatters equalised via Jorge Grant's free-kick, and Lee Angol's effort was then cancelled out by Jack Stacey. Elliot Lee struck what proved the winner three minutes later, and Luton could have made it 4-2 but Lee Collins' penalty was saved by Joel Coleman. The Shrews are second bottom, with Plymouth, the only other side on two points, below them. Elsewhere, managerless Blackpool were held 1-1 at home with Accrington, with Mark Hughes scoring a late equaliser for Stanley after Nathan Delfouneso had put the home side in front. It was the same scoreline in Gillingham's home clash with Coventry, which saw the visitors lead through Jonson Clarke-Harris and Elliott List bring things level. Saturday's other game was Southend's 1-0 win at Bristol Rovers, sealed by Tom Hopper's first-half goal.